Just wanted to share my new sample album! 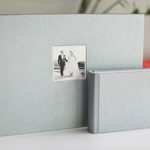 It’s a really beautiful fine art album that is a combination of a flushmount album and a matted album. And you can get a cute little flushmount duplicate of the larger album if you want – I love it! !